The NCHS’s exhibition, A Stitch in Time: Needlework from Westchester, 1774 to the Present, traces the artistry and social history of Westchester girls and women through needlework, from the colonial era to modern day. The exhibition focuses on the how and why of needlework: the techniques used, the skill and creativity exhibited, and the different ways in which the pieces represent evolving societal expectations of women and girls. The exhibition features over 20 samplers from Westchester County, New York. Many of the samplers are from the New Castle Historical Society’s Collection, while others are on loan for the exhibition from the Westchester County Historical Society and the Briarcliff Manor-Scarborough Historical Society. A major impetus for the exhibition was the NCHS’s recent conservation of a rare, early American sampler from its collection. Through generous grant funding from the Greater Hudson Heritage Network Conservation Treatment Program, the NCHS conserved Abigail Underhill’s sampler. 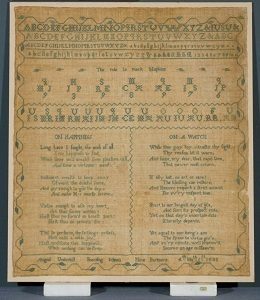 Abigail Underhill, a New Castle resident, created the sampler while she attended the Nine Partners Boarding School in 1800. The school, located in Dutchess County, opened in 1796 to serve Quaker families in the area, and was NY’s first co-educational boarding and day school. The Textile Conservation Workshop, located in South Salem, New York, completed the delicate conservation of this exquisite piece. This exhibition is available to view from Tuesdays to Thursdays and on Saturdays.